Step aside Hobo Wi-Fi, there's a new, better way for people to get their internet on the go. 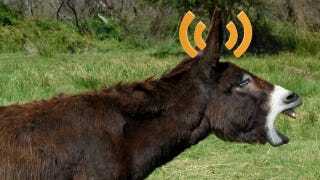 Introducing Wi-Fi enabled donkeys from Israel - ancient transport now updated for the 21st century. Kfar Kedem is a historical theme park with the purpose of reenacting life as it was 2000 years ago, including the ever popular donkey ride, now with a twist. Currently five of the donkeys are walking Wi-Fi hotspots with future plans to expand to the other 25 donkeys the park owns. If you ever take a visit it, watch yourself in case you're run over by a wayward child on the back of the donkey who's too busy Instagramming to look where he's going.